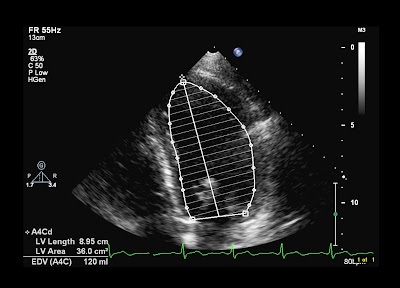 Andrew R. Houghton: Is a left ventricular ejection fraction of 50% 'normal'? Is a left ventricular ejection fraction of 50% 'normal'? What is a normal left ventricular ejection fraction? A seemingly straightforward question and, if you work in cardiology, you'll probably already have a specific number in mind. But this number probably depends upon which guidelines you use. There's a surprising variation between guidelines in what is deemed a 'normal' LVEF, and this confusion of reference values has been added to this month with the publication of the ESC's 2016 Heart Failure Guidelines. If you work in the US, then you probably use the ASE recommendations for cardiac chamber quantification, published in 2015. For 2D echo, there are separate normal ranges for males and females. For males, a normal LVEF is 52-72%, and for females it's 54-74%. If you work in the UK, then you'll most likely use the BSE guidelines for chamber quantification. According to these, for males and females a normal LVEF is 55% or above. Anything less than 55% is 'impaired'. So in the US, an LVEF of 54% would be labelled 'normal', whereas in the UK it would be labelled as 'impaired'. A difference of just a few percent might seem like splitting hairs, but the diagnostic labels we give our patients matter - just ask someone who's trying to buy life insurance how much difference a label of 'impaired LV function' can make. Things have become even more confusing this month with the publication of the European Society of Cardiology's new guidelines on heart failure. These take a new approach to diagnostic labels in heart failure, differentiating between 'reduced' LVEF (<40%) and 'mid-range' LVEF (40-49%). However they clearly identify a 'preserved' LVEF as being 50% or above. So now we have three different cut-off values for what constitutes a 'normal' LVEF: 50% (ESC), 52%/54% (ASE), and 55% (BSE). Oh, and for one added layer of confusion, the ASE guidelines are endorsed by the European Association of Cardiovascular Imaging, a community of the ESC - so one organisation effectively promotes two different 'normal' values. One thing that is clear is that there's a grey area around those with 'borderline' LVEF measurements, and a lot of work remains to be done to define which treatments are appropriate within this group. By highlighting those with 'mid-range' LVEFs with their new diagnostic category of HFmrEF, the new ESC guidelines have made a start in encouraging work on this group. But for those whose LVEFs are somewhere in the low 50's, I suspect it's going to be some time before we can agree upon a clear definition for those all-important diagnostic labels.
" Preserved " in the ESC guidelines does not necessarily imply normal EF.Don't be confused.